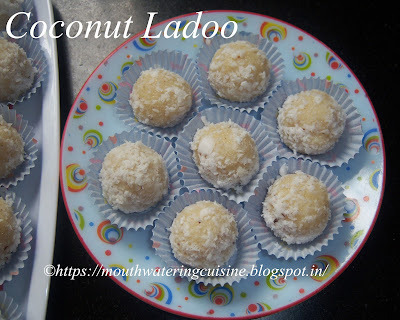 Hi, Good Morning, Thank you, friends and viewers, Today I will post how to make coconut ladoo with condensed milk. This is a very simple and easy recipe, even kids can do. Rather they have to do according to their class 1 EVS - Environmental Studies - text book. When Sahiti and Itihas in their class 1 (now they are in class 5), they have this recipe and tips to follow while cooking and how to handle such hot vessels and protect themselves from burns while cooking. I still remember that recipe and keep doing it regularly. Coconut is always available at every household during these festive season. These ladoos can also be offered to god during festivals specially Diwali-Festival of Lights. In a thick bottomed pan, add condensed milk, grated coconut and milk powder. Keep 1/2 cup of coconut aside to decorate. Heat on low flame. Stir ocassionally. Cook till it all becomes non-sticky andturns into a small dough. Entire moist from the coconut and condensed milk should evaporate. Switch off the flame. Allow this to cool until we can handle it. Set the remaining grated coconut in a plate. Line up the paper cups in a serving plate. Grease your hands with ghee, take small lemon size portion of the mixture and roll it into a ball. Roll this over the grated coconut. Place the prepared ladoo in placed paper cup. Make all the ladoos in the same way with the remaining mixture. But make sure you grease your hands for each ladoo. 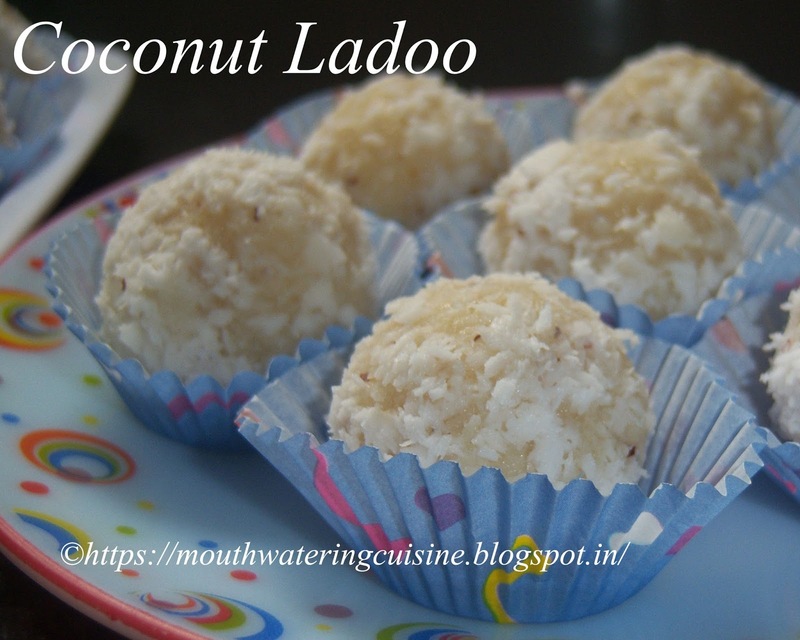 Enjoy coconut ladoos any time, evening snacks, in between meals.